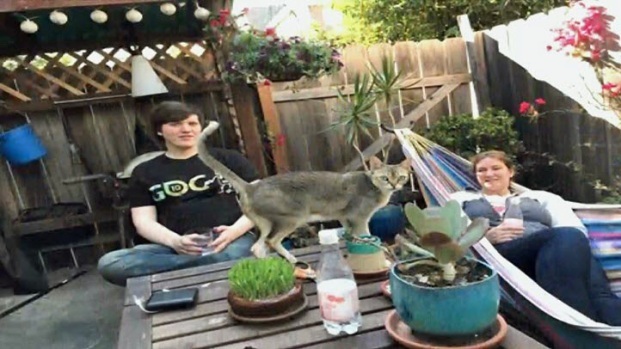 A couple and their two cats found dead in a Berkeley apartment last week were killed due to "acute carbon monoxide intoxication," police said on Friday. The pair was identified as Roger, 35, and Valerie Morash, 32, and their deaths were immediately flagged as suspicious, according to police. Officials had initially ruled out carbon monoxide or radiation poisoning, saying tests came back negative for those elements. On Friday, however, police said that evidence collected from the Morash's apartment was free of "toxins," but autopsy, toxicology and necropsy findings pointed to carbon monoxide intoxication. "It took some time to determine the cause ... however, our goal was to provide the family of the decedents with the most accurate answers regarding the death of their loved ones," police said in a statement. A Berkeley couple found dead inside their apartment have been identified as Roger and Valerie Morash, police said Tuesday. Elyce Kirchner reports. Investigators are still trying to track down the source of the carbon monoxide that caused what they deemed a "tragic" accident. Neighbor Maria Nadeu and two others who share her apartment have been uneasy since the Morashes were found dead in two separate locations of their unit. "Teresa next door said she heard beeping," Nadeu said. When authorities ruled out carbon monoxide poisoning, but refused to release more information, neighbors were panicked. "We’re not the public in this. We are actually tenants, potentially at risk," Nadeu said. According to Nadeu, residents were asked to spend a day away from the building starting at 6 p.m. Friday. She had her hotel reservations in place and even her cat was ready to go for the 24-hour evacuation, but building management sent out an email earlier in the day cancelling it. "Mystery upon mystery," Nadeu said. "Why would they cancel it?" Police, however, said the California Public Health Department did not order residents to evacuate and is working with them to respond to their concerns. "Investigators are focused on trying to determine the source of the carbon monoxide in order to provide peace of mind to the families and residents of the building," according to the statement. Police on Jan. 23 responded to the Morash's residence on the 3000 block of Deakin Street and found the two bodies. The cause of the deaths was not immediately apparent, police said, and the building was evacuated out of an abundance of caution. Police were alerted to the apartment home when a friend of one of the victims went to check on that person and found them dead. When officers searched the apartment, they found the second body, as well as two dead pets. The Morashes worked from home and residents in the building recall smelling fumes from a generator inside their apartment. A neighbor said she smelled burning rubber and even complained, but said nothing was ever done. "The problem is we are in the first line of hazard and we are not being informed of what’s going on," Nadeu said.